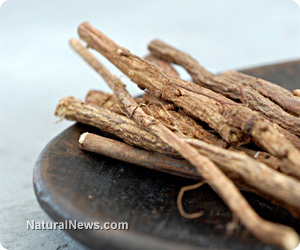 (NaturalNews) Ginseng has strong roots in Chinese medicine. In fact, its use is traced back over 5,000 years to the mountains in Manchuria, where it was incorporated into traditional medical practices. Emperors reportedly used ginseng to treat illnesses and as a primary ingredient in products like soap to get the best use of its beneficial properties. During the 1700s, ginseng was discovered in North America, and due to high demand and a burgeoning trade relationship with China, it became an extremely important part of the continent's economy. To this day, it plays an important role in the health and well-being of people around the world but has been considered endangered since the 1970s due to overharvesting. There is a long list of health benefits associated with ginseng, including a boost of energy, improvement in mental focus and cognitive function, anti-inflammatory properties, cancer prevention, improvement of erectile dysfunction, enhanced activity of the immune system, lower blood sugar levels, weight control and the alleviation of menstrual pain. Now, it is important to note that there are no standards with regard to the dosage of ginseng that you should take. This is something that should be discussed with a medical professional, such as a doctor or pharmacist. In many cases, dosage recommendations are found on the bottles in which ginseng is sold. There are always risks with taking a supplement, no matter if it is a synthetic or natural substance. Ginseng, though widely used and deemed relatively safe by public opinion, can come with some side effects. These may include headaches, nausea, dizziness, breast tenderness, an elevated heart rate, difficulty sleeping or restlessness. Additionally, if you are taking an MAOI (monoamine oxidase inhibitor), you may experience tremors or manic episodes. Furthermore, you should never take ginseng if you are on a medication to control heart disease or any other cardiovascular condition, as it can impact blood pressure and cause serious complications. And finally, ginseng should not be taken with medications that are targeted at blood clotting, as this can result in a risk of bleeding. Ultimately, ginseng is a wonderful supplement but only when used correctly. These drug interactions could be potentially fatal, so it is important to ensure that you are not taking any medications that may have a negative interaction with ginseng. How Can Ginseng Benefit You? People have taken ginseng for centuries to help improve their mood, to boost their health and to create a better sense of overall well-being. The benefits that you may experience cover a broad spectrum, as noted above, and can greatly improve your quality of life. The people who take this supplement regularly often report that they are impressed with the difference that it makes. Of course, this is only if it is a good idea to take ginseng given your medical needs and history. It is recommended that you speak with your healthcare provider before you start taking any new supplements. Should you opt to start taking ginseng, you will likely experience the benefits that it has to offer rather quickly.